EU parliament votes to recognize Palestinian state 'in principle', just hours after removing Hamas from terrorism blacklist. 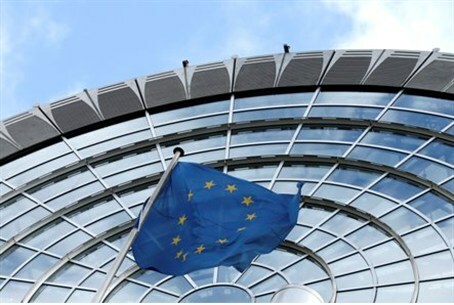 The European Parliament overwhelmingly backed the recognition of a Palestinian state "in principle" on Wednesday, following a series of votes on the issue in EU nations which have angered Israel. Lawmakers approved the motion by 498 votes to 88 with 111 abstentions, although it was a watered down version of an original motion which had urged EU member states to recognize a Palestinian state unconditionally. But the centre-right European People's Party of European Commission chief Jean-Claude Juncker, the leading group in parliament, forced them into a compromise motion linking it to peace talks. "There is no immediate unconditional recognition (of statehood)," EPP chief Manfred Weber said. But his socialist counterpart Gianni Pittella insisted it was a "historic decision" and a "victory for the whole parliament". Several European parliaments have passed motions urging their governments to recognise a Palestinian state in recent weeks in a bid to pressure Israel to relaunch the moribund peace process. France, Britain, Spain, Ireland and Portugal have all passed votes to that end. Sweden has gone even further, officially recognizing "Palestine" as a state. The vote couldn't have been more poorly-timed, coming just hours after the EU provoked a storm of criticism by removing Hamas from its list of terrorist organizations due to an alleged "technical issue." While EU officials rushed to explain that the move was only temporary and that it still related to Hamas as a terrorist group, Israeli officials were infuriated by the move. "We are not satisfied with EU explanations that the removal of Hamas from the terror organization list is a 'technical matter,'" Prime Minister Binyamin Netanyahu challenged. "The burden of proof is on the EU and we expected them to immediately return Hamas to the list as everyone understands that it is an inseparable part of it - Hamas is a murderous terrorist organization that notes in itscharter that its goal is to destroy Israel," he added. "We will continue to struggle against it firmly and with strength so that it will never achieve its goals." Other senior legislators had harsher words still, blasting the Europe's "blindness" and "loss of moral way." Deputy Transportation Minister Tzipi Hotovely (Likud) said the decision "testifies to the disconnect by Europe from reality." "Hamas which is responsible for hundreds of dead citizens in Israel, Hamas which trains three-year-old children with weapons, and Hamas which took all residents of the (Gaza) strip hostage as a shield for terror activities is the forefather of murderous terrorist organizations; those who whitewash an organization like this give terror a hand," she added. Likud Central Committee Chairman Danny Danon accused Europeans of reasonng "that their blood is holier while the blood of Israelis is abandoned - otherwise it is impossible to understand how the European court decided to remove the Hamas organization fromthe list of terrorist organizations." "In Europe apparently they forgot that Hamas abducted three youths last summer and shot thousands of rockets at citizens of the state of Israel," continued Danon. "This is European hypocrisy that is a continuation of their two-faced proposal to support the establishment of a Palestinian state. The message from the court: kill Israelis and get a state." Jewish Home chairman Naftali Bennett also condemned the decision, saying: "the sodomite laws of the European court allowed the spilling of the blood of Jews wherever they are and speak to the loss of a moral way." "If there's someone who thinks the sacrifice of Israel will save Europe, they're wrong," added Bennett. "Israel is strong and knows to defend itself from those seeking its harm, but the ones who will suffer from strengthening terrorist organizations are the Europeans themselves. Terror that receives justification in Tel Aviv will spill quickly to London, Paris and Brussels. Unfortunately Europe can't say we didn't warn them in advance." Knesset speaker MK Yuli Edelstein (Likud) accused the EU of "losing its head." "Removing Hamas from the terrorist organizations list by the Union's court teaches about the imperviousness and moral warping, and is a prize for Islamic extremist terror that strikes every place in the world including Europe itself. Is there no limit to shame? I hope that the injustice is fixed quickly."